The Theatre has been renovated and is a very active performance theatre. It is NOT closed. The photo you post is the OLD photo, although the new updated photo is in previous comments. The theatre seats 355. It is home to Downriver Youth Performing Arts Center, a youth theatre group working with ages 5-19, whose goal is the positive development of young people through experiences in the arts. We also have a summer program, workshops, and host entertainment and other civic activities! To date, over $500,000 has been invested in the theatre via the support and encouragement of generous community, individual, and civic funding. It i available for rental and even hosts a couple of weddings per year!. Hi, thanks for the great site, its been very helpful I have that architect Charles N Agree designed the Trenton Theatre, but since it was built in 1919, he couldn't have done the original. Do you know if there was a remodel in the art deco style, probably in the mid 1940s? Appreciate the help Glad the community got behind the restoration process and MI didn't lose another great theatre. WHOA Am I eating my words from a couple of years ago, or what The renovations are wonderful - the new marquee is spectacular Dr. Noel Jackson really spear-headed a spectacular rebirth of this theatre. My comments from 2004 were premature and based on photos that I have seen when the theatre first opened - of course, in renovations, it is hoped that bringing it back to original form happens yet updating it and making it shine is the ultimate goal. HATS OFF TO DYPAC for making The Trenton Theatre breathe again It is a joy to enter the doors and now has EXCELLENT CURB APPEAL. Trenton Village Theatre is owned by The City of Trenton, but is managed and leased by Downriver Youth Performing Arts Center, which is a non-profit organziation dedicated to the positive development of young people though experiences in the arts. DYPAC works with young people ages 5-19 and produces three to four theatrical productions during the year. DPYPAC also holds a Summer Fine Arts Camp for six weeks during the summer. The theatre is available for rental. Visit DYPACs website at www. dypac. com for complete information. TCP is one of the many groups who rent the theatre. Since DYPAC took over the lease, over $300,000 worth of improvements have been completed in the theatre, including new and improved restroom facilities that are handicapped accessible, remodeling of kitchen and lbby, improved lighting and sound, a new facade and fenestration, and most recently a new marquee. 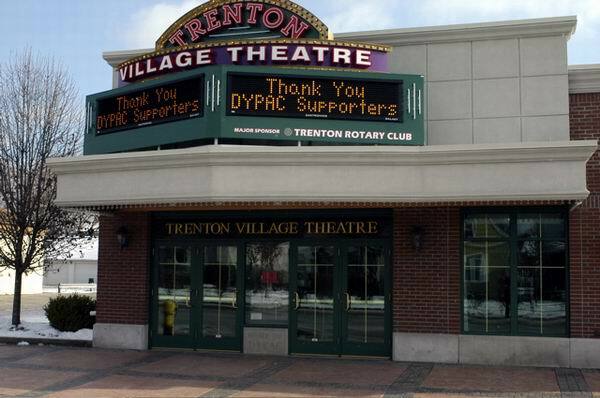 The Trenton Rotary was a major sponsor for the marquee. Due to the generosity and support of the community, this new marquee was installed December 2005. Inside, the theatre 32 lighted original masks are on display, all created by local artists. Please check out www. trentonplayers. com - the movie aspect of this theatre is closed, however, it is alive and kicking with stage productions from various local theatre groups. A renovation in progress, sadly not to the restoration of the original art deco, but to a more current and trendy look. February 1959 - Horstman and Co. get the job to install new attraction boards on the 40-year-old Trenton Theatre in suburban Trenton for William London of Los Angeles.